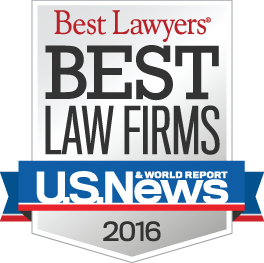 Jubelirer, Pass & Intrieri has been named to the 2016 edition of the U.S. News – Best Lawyers’ “Best Law Firms”. Our firm received recognition for professional excellence in the practice areas of Workers’ Compensation Law – Claimant, Labor Law – Union, Litigation – Labor and Employment, and Employment Law – Individuals. Rankings are compiled annually through client and attorney evaluations, peer review and information provided by law firms. To be eligible for a practice area, law firms must have at least one attorney included in Best Lawyers in that same area. Congratulations to Jim Welker who was recently awarded a Martindale-Hubbell Client Distinction Award. Martindale-Hubbell is the premier lawyer rating service in the country. The award is given to those lawyers whose clients give the lawyer a 4.5 average rating(out of 5.0) in the following areas: (1) Communications Ability; (2) Responsiveness; (3) Quality of Service; and (4) Value for Money. Less than one percent (1%) of the more than 900,000 attorneys listed by Martindale-Hubbell on its martindale.com and lawyers.com websites receive this award. Once again, our attorneys Ed Walter and Jim Welker have been selected by their peers to be included in the 21st Edition of The Best Lawyers in America for their work in the practice area of Workers’ Compensation Law-Claimants. Additionally, Ed and Jim have been recognized by Best Lawyers for being selected in the practice area of Workers’ Compensation Law for at least five years. For more information, go to www.bestlawyers.com. Jubelirer, Pass & Intrieri, P.C. has again been designated by U.S. News & World Report as a top-tier law firm for 2013. In addition, Joseph J. Pass has been selected by Best Lawyers in America in the area of labor and employment law, and Edward H. Walter and James A. Welker have been named in the area of workers compensation law for 2013. Mr. Pass has also been named Pennsylvania Superlawyers by Law & Politics and Philadelphia Magazine in the area of labor and employment law for 2013. Joseph J. Pass, senior majority shareholder of Jubelirer, Pass & Intrieri, has been listed in every edition of Best Lawyers in America, a compilation of lawyers rated by their peers as the best in their specialties. Those listed represent less than 1 percent of lawyers in America. Edward H. Walter has been AV Preeminent-rated by Martindale-Hubbell, has been selected for inclusion in The Best Lawyers in America and, for many years he has been recognized as one of Pittsburgh’s Top Rated Lawyers in the area of workers’ compensation. Contact us about your case by calling 412.281.3850 or emailing info@jpilaw.com.